A leader’s guide intended for use in group studying the life of Jesus and the gospels. Mary C. Morrison (1910-2003) devoted her life to family, teaching and writing. A major focus of her work was the gospels. She taught in a variety of settings, including Pendle Hill. 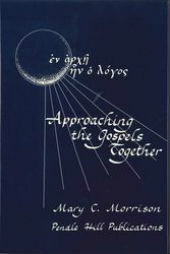 The open-ended study questions she honed over years of teaching are available in Approaching the Gospels Together: A Leader’s Guide for Group Study. She recorded her own views on Jesus in Jesus, Sketches for a Portrait. Mary Morrison and her husband, Maxey, raised a large and loving family. She considered herself 51% Episcopalian and 49% Quaker. She wrote her final Pendle Hill pamphlet, Gift of Days, out of retirement at 92.